This is our choice for the most creative winter wedding centerpiece. 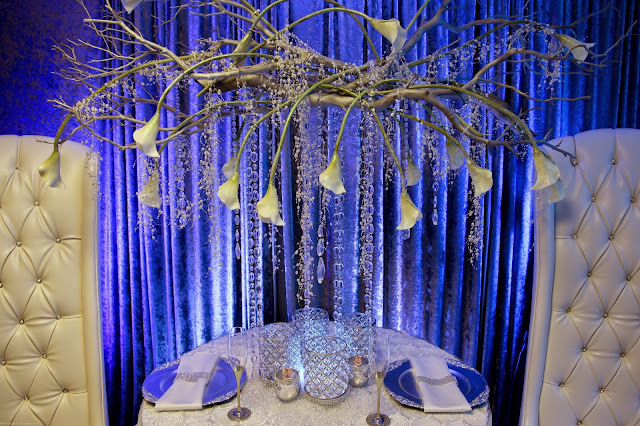 They used artificial calla lilies zip tied to some branches and draped with clear acrylic beads hanging from the arrangement. This is then hung with clear fishing line to give the effect of it floating above the table. A few matching candles below brings the table and floral arrangement together. We liked the idea of the bride and groom having their own table that was decorated just for them. Great job and keep the pictures coming in!